Posted by susan: January 2nd, 2014 under Fitness, Susan. Where did the last two months go? 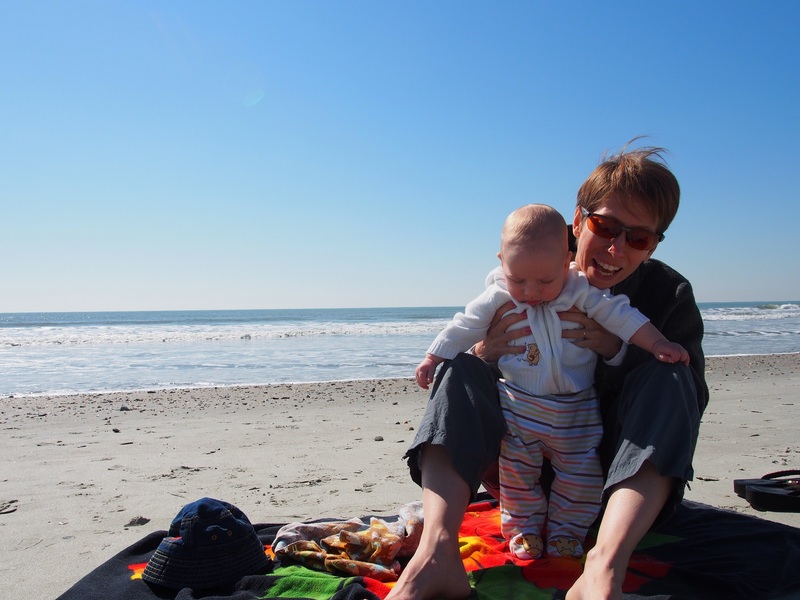 Oh yeah, a trip to Florida, a trip to North Carolina, various Susan business trips, and a baby who turned one! Without further adieu, here’s peaks 13-24 of my 48. This doesn’t technically count as a winter hike but easily could. I hiked this one solo. 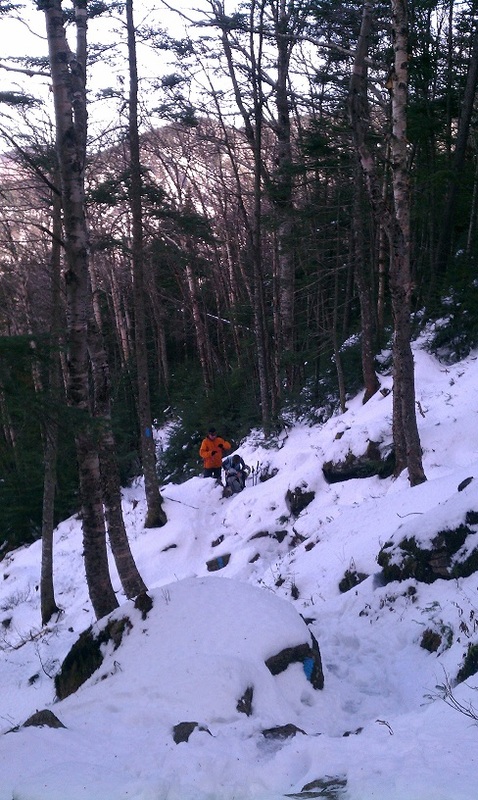 The trail was packed snow and ice so I did a lot of postholing and careful scrambling. 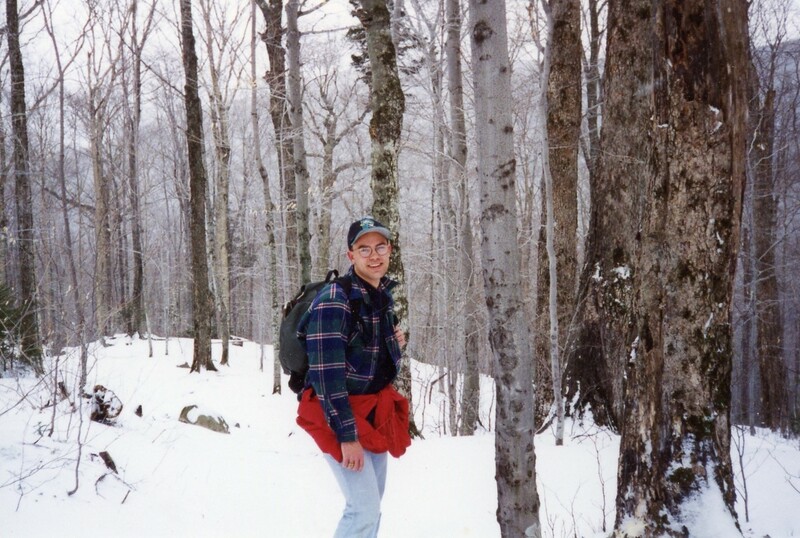 This was before I learned about the wonders of yaktrax, crampons, and online trail reports. A three day hiking trip with hiking buddies Steve and Rich. Day 1 Steve and I drove up together and warmed up by hiking part of the Mount Jackson trail. Steve had brought an extra pair of crampons for me to use and boy did they make a difference. Lots of postholing. Day 2 all three of us hiked the Avalon, Field, Tom loop. Steve and Rich did not want to go up Mt. Tom as it had been a long tiring day in the snow and ice already so Steve made me a bet. If I could get up Mt. Tom, back down, and catch them on the trail before they got to the car, he would buy wine at dinner. They set out going straight back and I had wine on my brain and charged up Mt. Tom. I caught them just below snowline as they were taking off their crampons and greatly enjoyed my free wine that night. This was also the first time I’d ever seen a moose in the wild. At dinner, a large moose wandered into the field outside the Highland Lodge to graze. Hiked with Susan who thinks this may have been one of her very first hikes back in college with a friend from WILG. A little snow still at the top but mostly clear. 1:45 up, 1:10 down. Su and I. Gorgeous 80 degrees and not very humid. Hike was like a giant stairmaster. Did this hike with the Susan and all 3 (at the time) Sheldons. 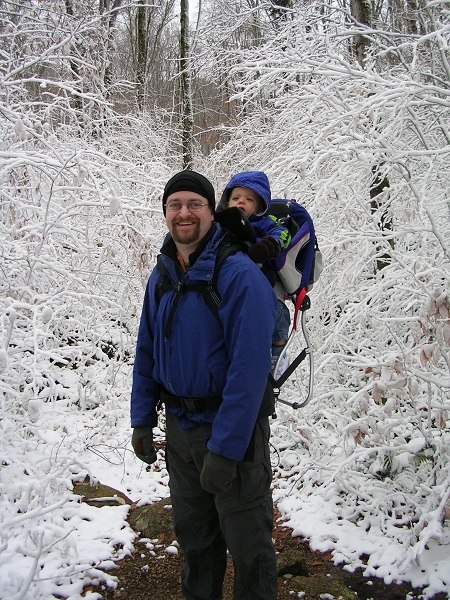 It was early season snow and while the trail was easy the Sheldons had to turn around early after Max took off his mitten and threw it out of the backpack which wasn’t noticed until later when Max started crying and they had to turn back. It was still a fun time and a beautiful day. Hiked with Susan. A short hike on a lovely spring day. Nice views of the notch and north to Washington. I solo hiked this on a long, long day. 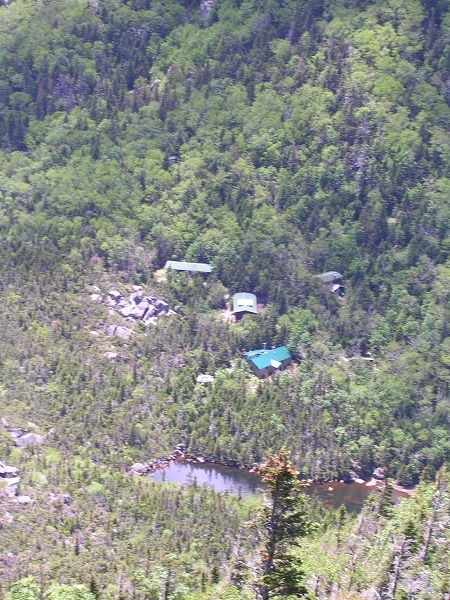 I hiked in 19 mile brook trail to Carter Notch hut, climbed Carter Dome, and came down the Carter Dome Trail. The hike from the hut to Carter Dome was incredibly steep. The picture is from the trail down to the hut I had just stopped at. This was also my first hike on Carter Ridge and I was amazed how great the views were of Mt. Washington to the west and of Maine to the east. I came from down there?! Hiked with my buddy Brian. One of my most memorable hikes. I had never hiked with Brian before but knew that he did a lot of outdoors type stuff. He worked with Susan so I knew him socially but we were not yet really friends. We decided to hike the Kinsmans going up Fishin’ Jimmy trail. We had a great, long hike up and turned around to come back down. I had been leading so I let Brian lead on the way back down. Big mistake. I did not realize he was navigationally challenged although he would have freely admitted it if I had asked him. We ended up taking a wrong turn and when I realized it and checked our map we were already hiking on a fun trail with a short series of peaks called “The Cannonballs.” We finished our hike, extra miles and hills and all, had a good laugh, a good burger at a place Brian showed me, and a friendship was forged. However, whenever we are outdoors together, I navigate! I did this as a solo hike mostly to knock it off my list. Not a lot of great views, just some pretty wooded trail. The memorable thing about that day was finding a huge “sign” on the ground made out of sticks pointing someone named Ann in a particular direction near the trail split. Posted by brian: November 6th, 2013 under Brian, Hiking. I have been thinking a lot about what I want Isaac to believe is “normal” – what activities we do as a family and what he grows up to enjoy. One thing we’re trying to encourage is family dinner time, where we site down together and eat the same thing. So far Isaac is still enjoying kale, beans, squash, ratatouille, oatmeal and all kinds of fruit, so he is a good excuse for us to eat healthy. Another thing is exposing him to the outdoors at an early age. In this endeavor, surely the Hines/Phillips family’s hikers and environmental activists are good role models! So I was excited to see if Steve and Connie were willing to spend an October day enjoying the foliage on a hike with Isaac and me this weekend. Of course Isaac decided to sleep in until 7:30am, more than an hour past his normal wake-up. Usually sleeping in on a Saturday would be welcome, but today we intended to be on the road at 8am! 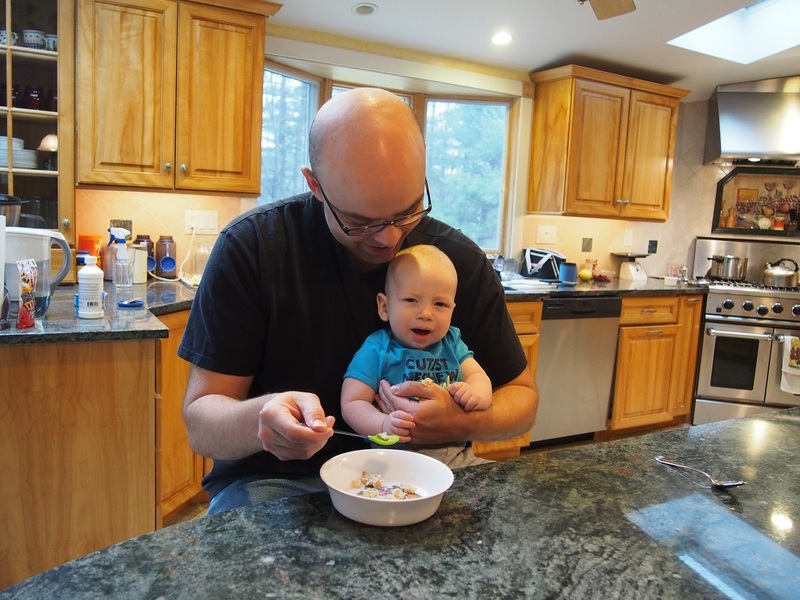 After some chatting while Isaac ate his breakfast, we did make it out of the house by 8:30am on the way to Mount Monadnock. We enjoyed the scenery along Rtes 2, 140, and 202 on the way up and Rte 119 on the way back, as trees were definitely starting to turn colors. We were sad to drive past the many farm stands selling mums, pumpkins and apples, but we were on a tight schedule and figured we could do some shopping another time. Clearly we were not the only New Englanders with the same idea on Saturday – the state park was packed! And given that I was toting a rather heavy 11-month old (he is easily 20% of my weight), we set out on the more moderate and less traveled Parker Trail on the way to the Old Toll Road. But when we encountered the Cliff Walk trail, Connie suggested we check it out. The new route provided near solitude (we didn’t encounter another hiker until after the junction with Do Drop) and more scenic path, with only a few steep spots. We enjoyed some pine forest, mossy growth, and beautiful views. When we got to Bald Rock, we stopped for lunch to soak in the open vistas. Hearing and seeing the 100s of hikers at the top and having no need to summit, we then opted to continue in a loop onto the Smith Connector and Amphitheater trails to White Arrow and back along the toll road. White Arrow was the typical “stairmaster” of rocky steps, compounded with enough water to make them slippery going, so we tread carefully on the way down, but then picked it up on the Toll Road and Parker on the way back. Isaac loved the trees and would chatter away at me while awake. He loved smiling at the other hikers and looking around. He fell asleep after a section of rock scrambles and slept through lunch, so we stopped along the White Arrow to give him some banana. He was a trooper to stay in the backpack for 4 hours straight, and only complained a bit for the last section (audibly and by pulling my hair). Connie and I distracted him with some bright yellow leaves, which he proceeded to try to eat, requiring us to fish them out of his mouth. I suppose a little leaf and dirt is good for him. One of my favorite moments was when Steve, Connie and I all sang “Old MacDonald” as we hiked along the road. 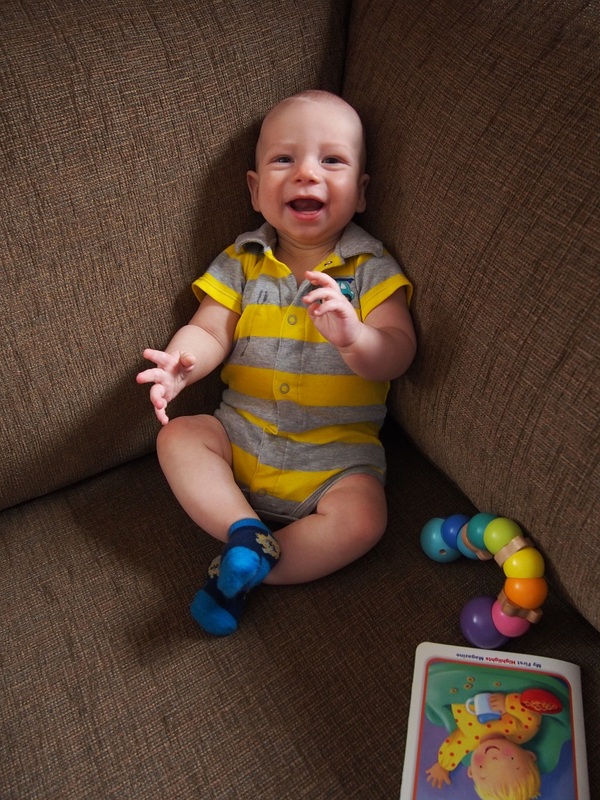 Isaac seemed happily surprised to be serenaded by his favorite song. He did get a proper lunch and time to crawl around the back seat before we headed home. And luckily Steve and Connie each had great back seat games to share with Isaac to keep him entertained during the drive. Here’s the one picture from the hike, of Isaac sleeping through lunch. Evidently the fresh fall air is tiring, even when he gets to ride instead of walk! Posted by susan: October 6th, 2013 under Hiking, Little Juddmansee, Susan. 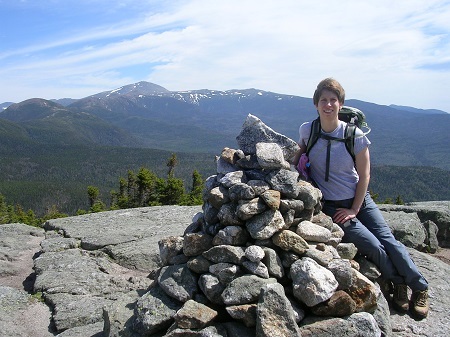 On August 31, 2013, I hiked my 48th 4000 foot peak in the White Mountains. The AMC has a list of the peaks over 4000 feet and hiking all of them will get you in the club. The club was started in 1957 and welcomed its 10,000th member in 2012. I’m sure more people have climbed all 48 than are in the club but it’s a rough idea of how many others there are out there who enjoy the White Mountains. I’m going to split this post into four parts since there are so many memories and photos I want to share. As I went back through the photos I had to make some changes to the “official” ordering of my list as some of the old photos confirmed that I had in fact hiked a peak well before I recorded it after re-hiking it later. 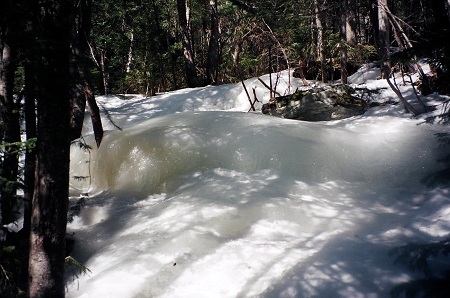 First White Mountain hike: Back in Spring of 1995 or 1996 my girlfriend and I went to the White Mountains for the very first time. I attempted to hike Mt Lafayette having no real gear or idea what the conditions would be like. This was early in the internet and there was no website with current trail conditions and trip reports like exists today. I remember trying to borrow boots from my friend Chris but in the end I think I opted for tennis shoes. I also wore jeans and had to borrow a pack. I also had to rent a car in order to make the 3 hour trip north. We made it as far as Greenleaf Hut which is about 1000 feet below the summit all the while scrambling up icy slides in our tennis shoes. Needless to say we did not reach the summit and slid most of the way back to the car on our butts. Nevertheless I had a great time and my interest in hiking in the Whites was born. #1 and #2 – Lafayette and Lincoln: Later in 1995 or 1996 I went back with my friends Chris and Dan to do that same hike. 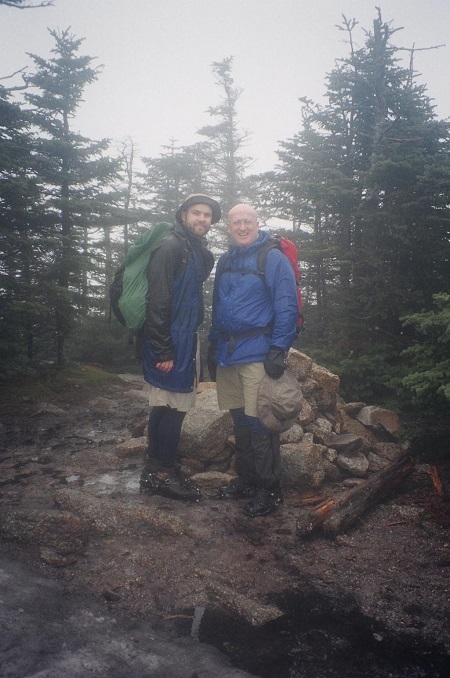 I don’t know exactly when we hiked it and I don’t have any photos but I remember it being a grey, rainy, and wet day on Franconia Ridge. We hiked up the Old Bridle Path, had lunch crouched behind a rock on the ridge, and hiked down Falling Waters trail. #3 – Moosilauke I’d forgotten that I did this hike in 1999 with Chris until I went looking for photos and discovered one of Chris and I at the Moosilauke trailhead. 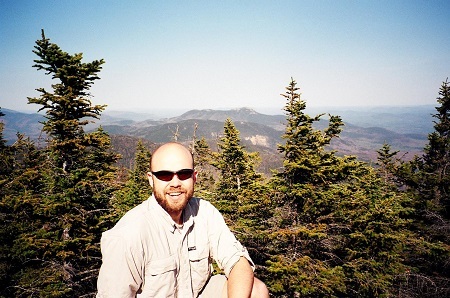 Initially I thought when I did this hike in 2004 with Steve it was my first time. What I do know about the Moosilauke hike with Steve in 2004 is that was the first time I was made aware of the 4000 foot list. Steve was working on completing his 48 at the time and told me about it. At that point I started tracking what I had hiked. #4 – Cannon Another double hike! 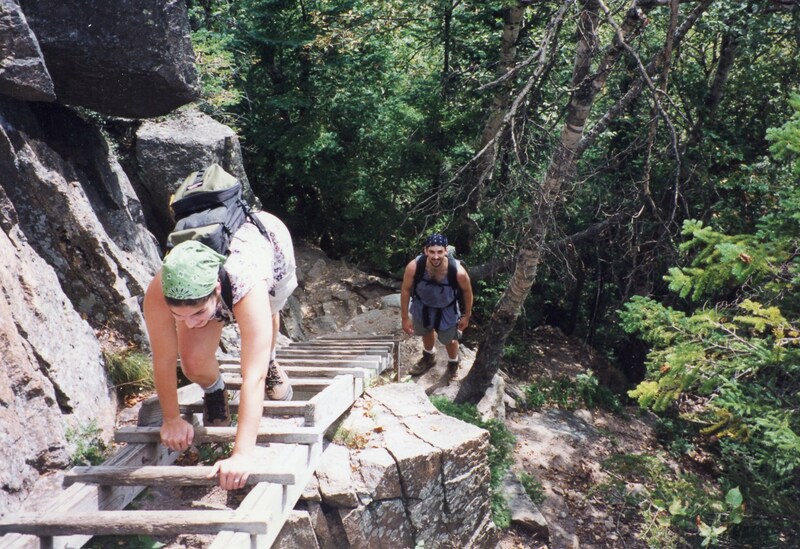 As my discovered photos indicate I did this hike with Chris and Tenille in the summer of 1999. However I didn’t remember that until November of 2011 when I hiked Cannon in the snow with Susan, Steve, and Erik. When I got to the tram station and ski lifts at the top a flood of memories came back from that day in 1999. The vivid memory other than the ladders pictured below are of coming off of a relatively secluded trail and finding 11ty billion tourists on the top who had ridden the tram up from the base station. #5 – Osceola I have no photos of this trip. Sometime in 2001, Susan and I hiked Osceola. 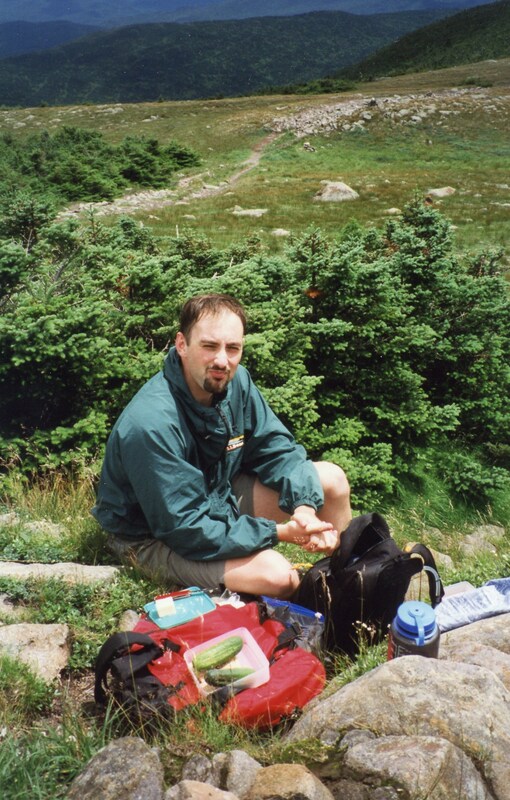 Since I wasn’t keeping track of my peaks yet I’m not sure if we hiked East Osceola in 2001 or not. This would prove to be a problem later as when I went back to officially hike East Osceola as my 25th peak in 2008 I got bit by a tick and ended up with a nasty illness that took about 4 months to recover fully from. 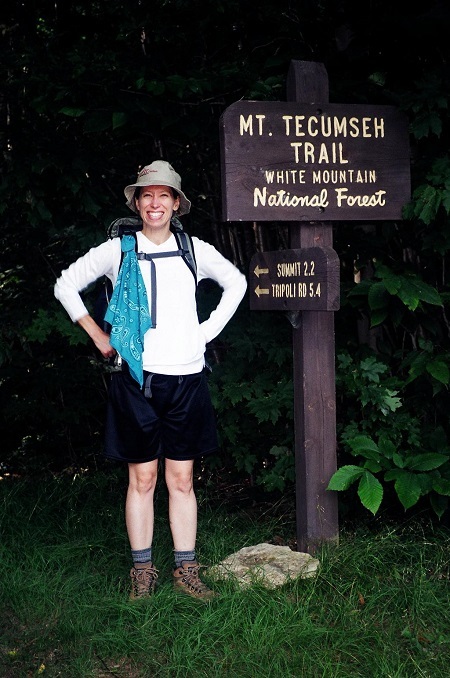 #6 through #12 – Presidential Traverse! 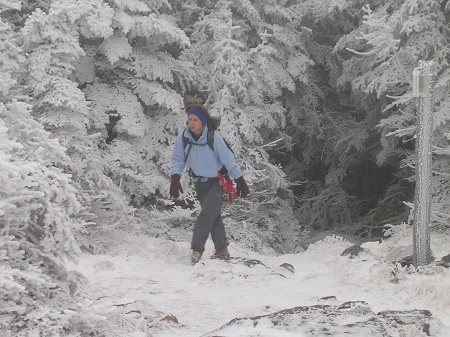 One of the classic New England hikes. 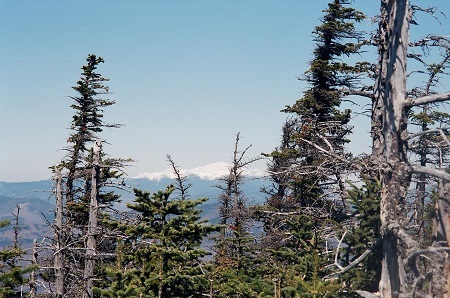 This is an approximately 20 mile hike over the alpine peaks of the Presidential Range in the White Mountains. I did this hike with Susan and Dan (in body) and Steve (in spirit since his body was at home recovering from kidney stones). We did this hike over 4 days and hiked Pierce, Eisenhower, Monroe, Washington, Jefferson, Adams, and Madison. Day 1 was a short hike up to the Mizpah Spring Hut. Day 2 took us to Lake of the Clouds Hut which we got to right before a huge storm rolled through, Day 3 took us to Madison Hut and day 4 we hiked out. The weather was clear all of the days except for the storm while we were safely in our 2nd hut. I hope I can do this hike again someday. One of my favorite things in the world is to walk along an exposed ridge line and this is the longest stretch of exposed ridge I can think of in New England. Why do they call it Lake of the Clouds? Posted by brian: September 2nd, 2013 under Brian, Friends, Hiking, Susan. Isaac and I enjoyed a beautiful clear day on Saturday with our first excursion to the White Mountains. We got a later start than we’d hoped, but on the plus side we were both well rested and had a good breakfast. We survived a long traffic backup on I-93 (accident north of the tolls), found a Tedeschi for their restroom, took the opportunity for a stretch break and lunch in the car, and made it to the Greeley Ponds trail head on the Kanc at 2pm. 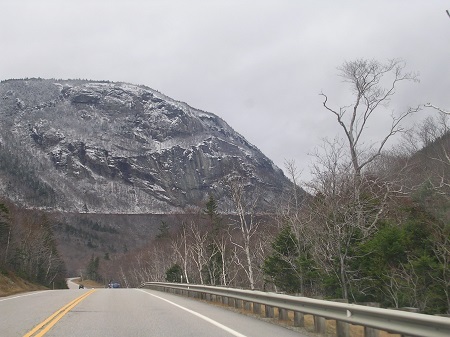 I felt noticeably more relaxed after seeing the sign welcoming me to the White Mountains. Something about the mountain air, gorgeous views and blue sky just melts the stress away. Isaac had fallen asleep after lunch, so I had time to change into hiking shoes and load up the pack. I used the Chicco backpack with the sun cover, which Isaac really enjoyed, and then I strapped my camelback to the pack frame, loaded with water, a first aid kit and a spare diaper. After hoisting ~30 lbs onto my back, we were off! Not far into the hike there is a stream crossing. Anyone who has hiked with me knows that I’m not good at crossings. My trail shoes are a big improvement over boots, because I have a better feeling for the slippery and uneven rocks, but I was not ready to try to balance or take precariously large steps across a pretty fast moving stream while still getting the hang of shifting the extra weight. So after surveying the options and watching a couple hikers cross back the other way, I opted to just wade across. It was up to my knees in places, but luckily for wool socks and shoes with good drainage, the experience was quickly forgotten as we kept tromping up the the trail. I thought to myself that I should be a better role model, so Isaac avoids that moment of paralysis when encountering a rushing stream, and learns to simply pick his way across the rocks – or splash through – without thinking too much about it. It was a lovely afternoon, with only a few other hikers and some students doing trail maintenance. Isaac smiled at all of them. The trail was a bit muddy in places, as it followed a stream, but was cool and shady without any bugs. It took about an hour to get to the pond, where there is a stony beach along the shoreline. Isaac was happy to get out and walk around, making a bee line to splash in the water. He was also happy to sit and play with the stones, until I stopped him from eating them, which resulted in tears. After a half hour break and a snack, it was time to head back. It only took 40 min to return to the trailhead, where we took off our wet shoes, ate more food, and got ready for the trip home. Isaac settled down and slept nearly the whole way home. 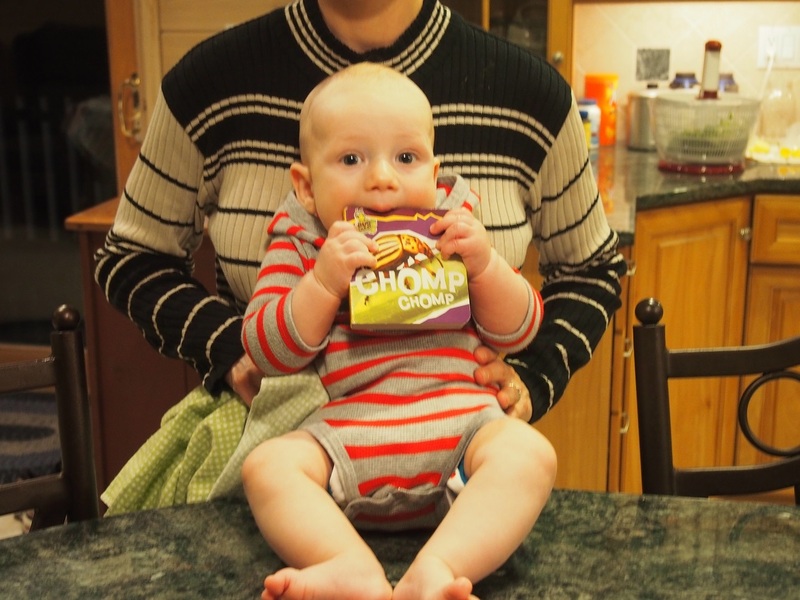 We arrived in time for dinner and Isaac was ready for an early bedtime after his big day of adventure. I count this first “dry run” as a success! Isaac was a good traveler and clearly loved the hike. He didn’t squirm or kick, and I think we could have done a longer excursion if we got an earlier start (and/or a shorter drive). The two hours were enough for me to get my mountain “fix” and let go of any nagging issues on my mind -good for both physical and mental exercise. It was a good hike for me to regroup and rejuvenate, to balance being the old “me” and the new mom “me”. I imagine it would be easier to have one person carry the baby and another to carry a day pack, (and also the 2nd person could take photos!) but it’s good to know I can handle it myself. I look forward to more hikes this fall! Posted by susan: August 11th, 2013 under Hiking, Little Juddmansee, Susan. Oh dear, what happened since May? June and July have been well documented on our flickr account but we’ve gotten pretty lax in our blogging. Water: We opened the pool at the beginning of May, and all 3 of us really enjoyed the water thanks to the heater we put in this year. 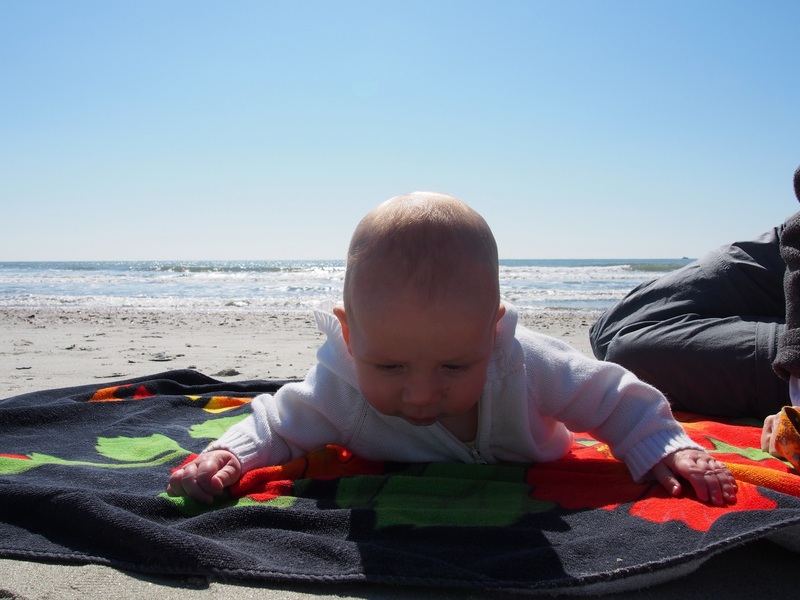 Isaac started out enjoying floating on his back, but now he really likes the front crawl, both on land and water. He loves the water, at bath time or pool time. We’re trying to teach him to blow bubbles and not swallow water. We hosted a Memorial Day party again this year, and had almost as many kids as adults. Most weekends you can find us having a few friends over to splash around and cool off. Isaac and Brian did their first swim class at the Y today, and learned some songs and games to play. Isaac seemed to have a great time even though the water is a bit colder there than at home. 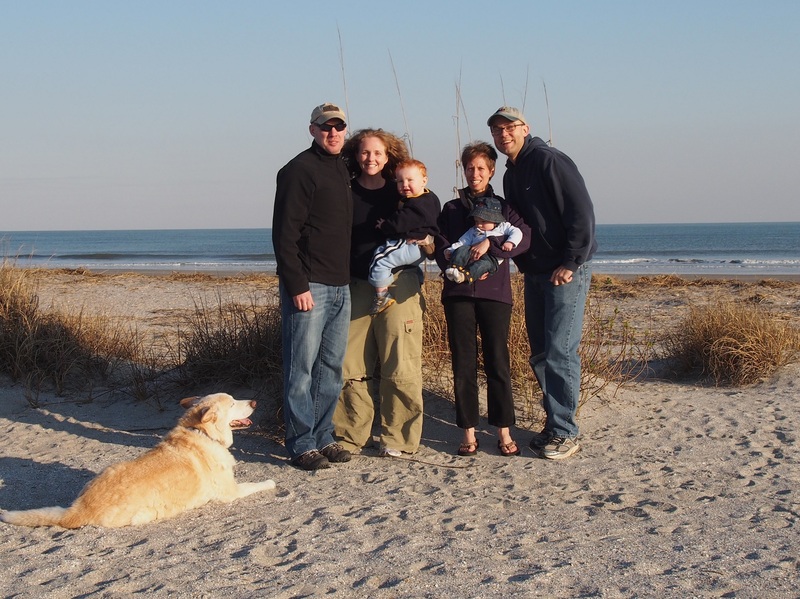 Travel: Somehow this year’s trip to visit our family seemed even more rushed than usual. Maybe it’s because Brian’s mom and grandma are getting ready to move, or because we’re sensitive to Isaac having down time between meeting so many new people, or maybe we’re just getting older. But we had a wonderful time seeing family, and realized how hard it is for them to be so far away. Some of the highlights for Isaac were showing off his eating and crawling skills, playing with puppies, swinging with James, seeing grandparents and great-grandmothers, some of our oldest and youngest family members, and learning that beards aren’t actually that scary. The hardest parts were sleeping in so many new places and spending lots of time in the car. But we all were good road trippers overall. Work: I have a new job as of June, in the same company, but a different position. The good news is that it’s more self-paced and doesn’t have sales and funding goals. The bad news is that it’s self-paced and I have some bad habits to break! July has been a bit better with coming in early, leaving at a reasonable time, and getting in a few more workouts during the week. I have visited most of the sites where my software engineering team works, and I’m learning a lot about the breadth of our company’s capabilities. It’s been an adjustment to get used to a different culture, a different boss and a different set of co-workers after being in Burlington for almost 10 years. But I’m confident this is a good move for me and I look forward to getting settled and making real progress. 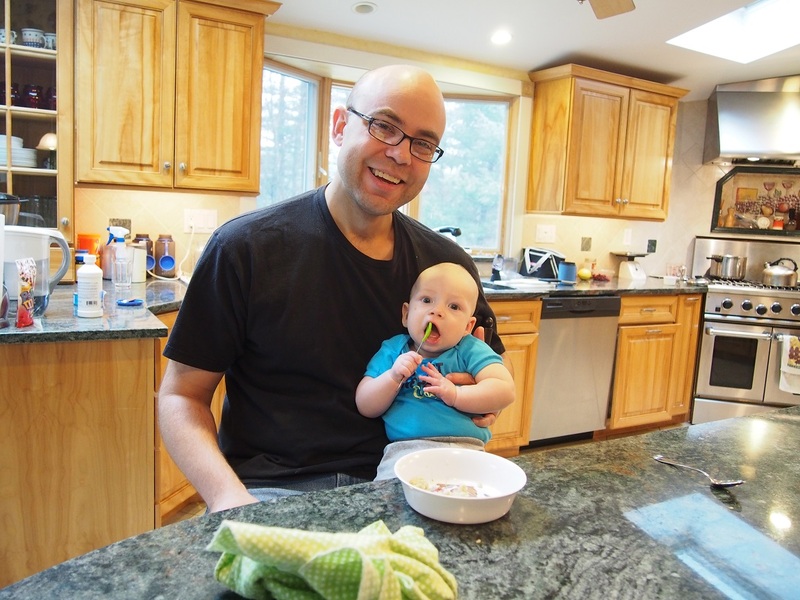 Exercise: Brian competed in his first race since Isaac was born, and literally made a splash at the Wildcat Sprint Triathlon in Lowell last weekend. He saw a flyer for the race at the Y when he joined, and decided that it was time to baseline his fitness. It turns out that he had a terrific race, placing 3rd in his division! Woohoo! Other than that, the weeks seem to go fast. Between trying to get a reasonable amount of sleep (sometimes interrupted by 3am feeding, sometimes not), keeping healthy food around to eat, chasing an active baby and having a little down time to feel like a normal adult, life is busy and fun. We’ll try to do better about blogging as the summer days fly by in August. Posted by susan: August 2nd, 2013 under Family, Friends, Little Juddmansee, Susan. I’ve been running “weekend warrior” style for a couple months, meaning that I rarely exercise during the work week, but I try to do at least 5 miles any day I have off work. I have gotten up to a 10K on the bike path with Brian and Isaac in the stroller a few times. 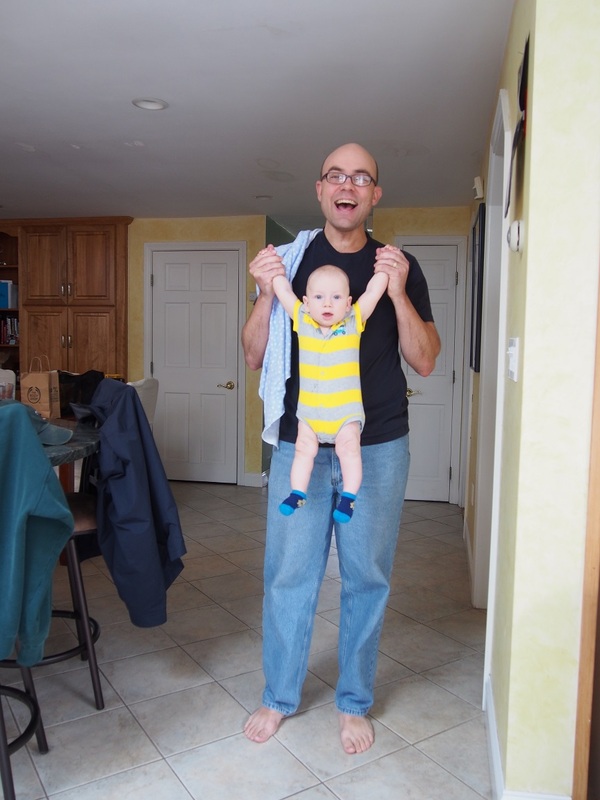 Once spring weather arrived and Isaac started sleeping through the night, at least occasionally, I got in a spunky 5 mile tempo run at sub-8:30 pace and thought it might be time to sign up for a race. The Westford Road Race seemed like just the right event – local, small but well run, and a short enough distance that I wouldn’t have to “train” – just use it as a check in on my fitness. I managed to get out on Saturday afternoon for a 5k through the woods to work out the kinks from the week. On Sunday the weather was gorgeous, sunny with a slight cool breeze. I skipped social hour at church, got home, fed Isaac and put him to sleep for his nap, and got myself packed up to head over to the race. I found parking, walked to the starting line area to pick up my race packet, and checked out the scene. There were TONS of kids and families doing the fun run (2pm) and 5K (2:20pm), but a smaller set of more serious runners registered for the 10K. I had plenty of nervousness, especially since Brian wasn’t there to pace me or talk me through the plan. I tried to stay calm by warming up, chowing down on a granola bar, and watching the kids and dogs sprint around the lawn of the school. Finally at just before 2:30pm, it was time to line up for the 10K, and with a short blast of the horn, we were off. The start of the race was downhill, so I hoped to be warmed up enough to take advantage of it. Sure enough, I came through the first mile at 8:10, right on pace. Then I picked up the pace a bit more as there were MORE downhill sections, for a 7:04 and 7:52 at nearly halfway. I passed a father and his young son (maybe 8 years old?) running together, and smiled thinking about the possibility of Isaac running with me one day. I told them that they looked great, encouraged them as they started the uphill section, and then took off to try to catch the next pack. Through miles 4 (8:23) and 5 (8:59) I mainly settled in to the grind of the hills, trying to run smart and not let anyone pass me. A small group of us kept passing one another and then getting caught again, depending on the terrain or who took water breaks. Then it was the 6th mile, time to pick it up and see what kick I had left! The answer was not much as I got passed at the end by two of the women I had passed on the hills, but I still came in at a respectable 50:40 for an 8:10 pace. I walked around to cool down, wheezing a bit from the effort, and chatted with some of the group that paced together with me through the hills. I grabbed an orange, bottle of water, and banana, and headed back to the car to head home. It was a surreal 3 hours of time to revisit the racing side of me that I hadn’t experienced for over a year, but then it was back home to tag back into “momma mode” and feed Isaac. I’m not sure what event is next for me. Though I gravitate toward the longer distances and the feeling that I can keep going forever, I don’t really want to spend the time to train for anything longer than a half marathon right now. I have been loving the trails at the park, and thinking about the North Shore Trail Running series. Mainly I want to try to ramp up the intensity and frequency of my running to get back into a normal schedule, and maybe add in the elusive strength training and yoga that I often consider but never seem to make the time to do. If you’re up for a run sometime this summer, definitely give me a call! I now feel officially back into the swing of running. Posted by susan: May 10th, 2013 under Fitness, Susan. 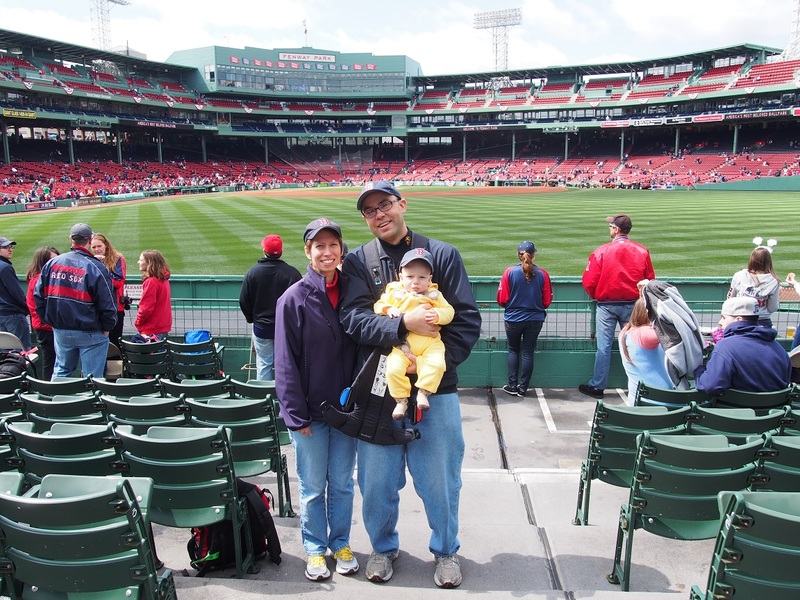 Last Monday was the Red Sox home opener and Isaac and I planned to watch it on television. I got Isaac dressed up in a cute baseball outfit and started preparing breakfast. Then the phone rang and it was Mr. Dunn offering us his extra ticket to opening day. I said hold my calls. 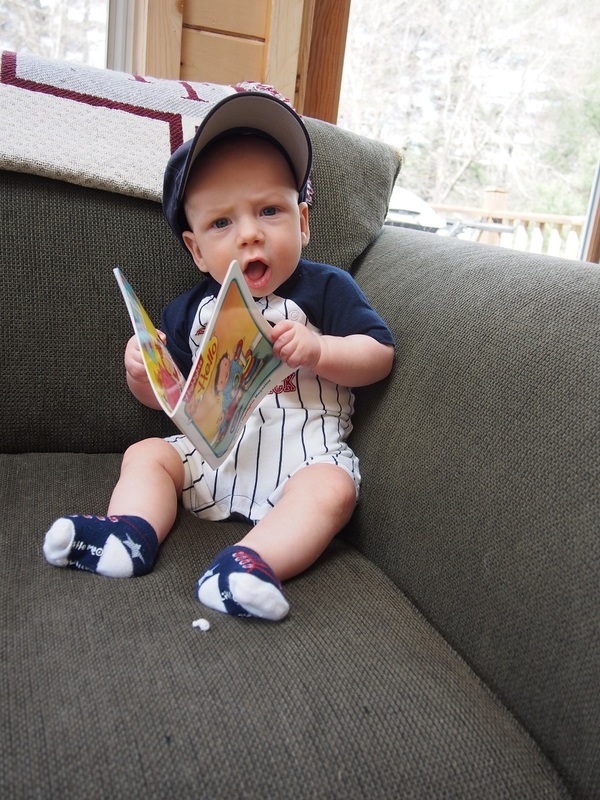 I’m reading! 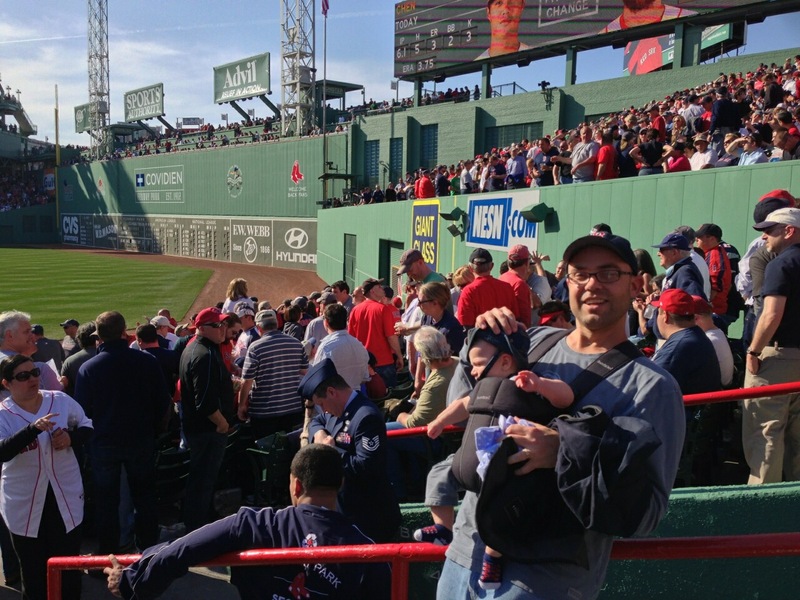 We said we’d love to go, had a quick breakfast, packed the car and then we were off for Isaac’s first trip to Fenway. The Sox won and the weather was gorgeous. Isaac managed to nap on my lap during the 2nd and 3rd innings and we took a feeding/diaper break in the 5th and 6th but were back in time to watch the 7th through 9th. 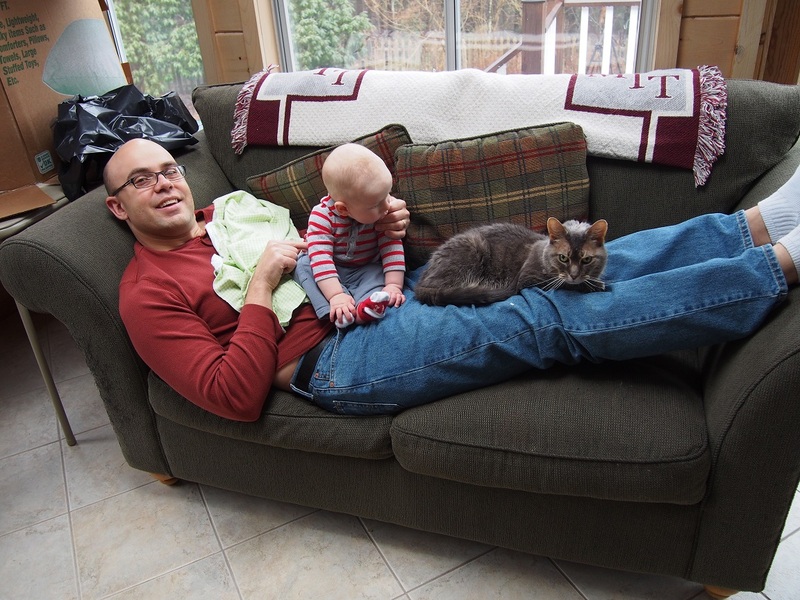 On Tuesday we had a relatively quiet day at home. We built a fort on the couch and played a nice game of peek-a-boo. If you can’t see the video below in the email/blog you can click HERE to see it. On Wednesday we were at home playing on the couch when one of our friends noted we had a lot of photos if Isaac sitting in a corner. We decided to fix that by showing the camera one of our new tricks. 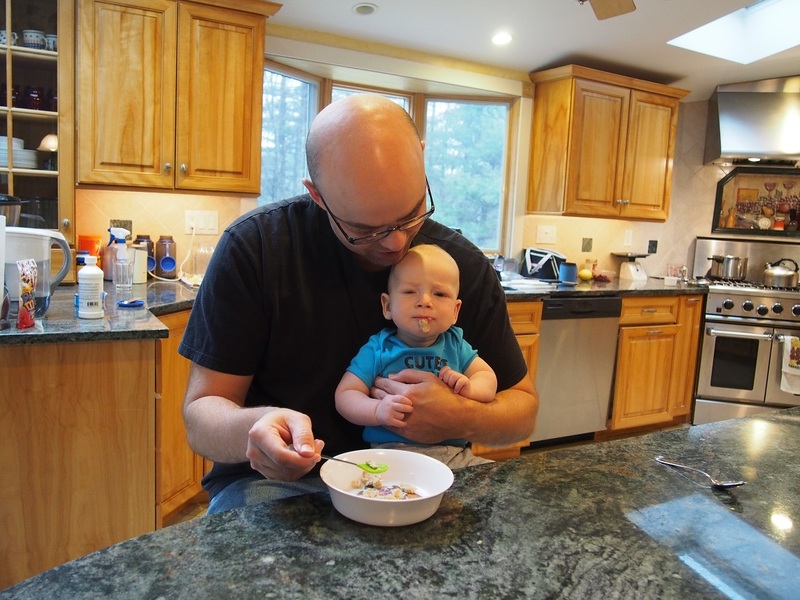 Isaac has been easily finishing 9 ounces bottles for about the past two weeks and has started expressing an interest in what Su and I are putting in our mouths. 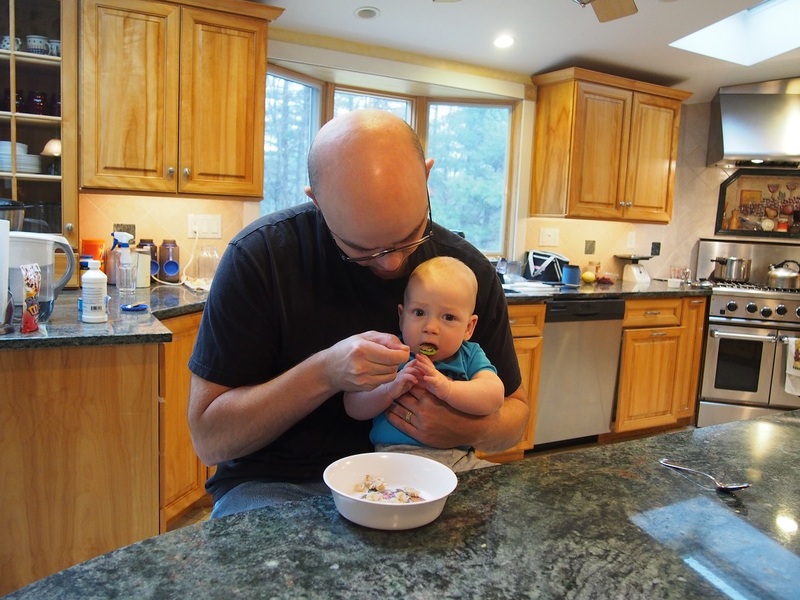 We’ve given him some tastes of food on our finger so on Thursday we tried some oatmeal with a spoon. Results were mixed. Most of the oatmeal went out. Some stayed down. The stewed raisins went over the best. On Friday Susan was off of work and both of us had dentist appointments so we loaded up the car and took Isaac to meet our favorite dentist/triathlete. After the dentist we stopped in Newburyport to buy some fresh produce from Tendercrop Farm and to have lunch at Agave. When we got home Isaac and I spent some time hanging out on the couch playing with our feet. Then Isaac discovered Slinky. Isaac is apparently very literal as he took the title of this book to be instructions for what to do with it. Topping off our big week was Susan’s first Sox game this year and Isaac’s second. The weather was chillier than opening day but still quite pleasant for April. 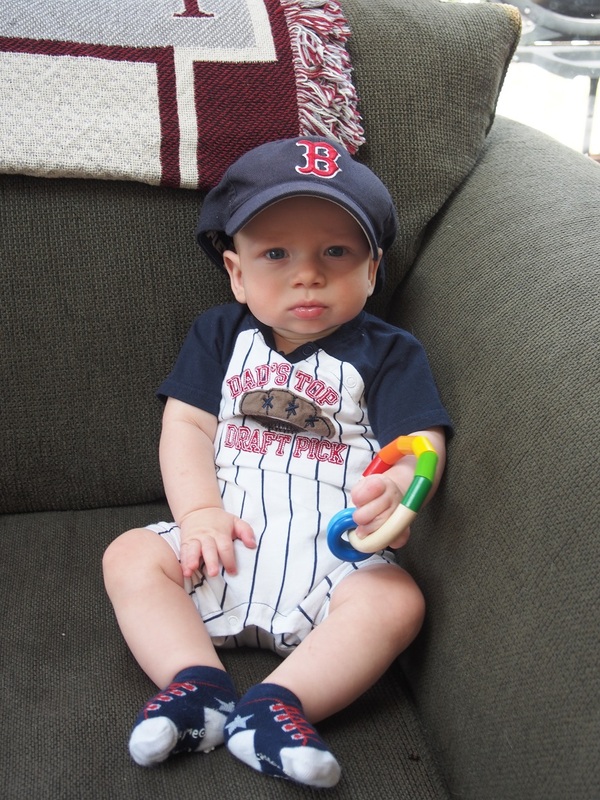 We bought Isaac his first little Red Sox cap and headed to our seats. We discovered the usher who works closest to our seats has the exact same birthday as Isaac. She was very happy to make goo-goo eyes at him and take this picture for us. Saturday evening Susan and Isaac went to the Fortunetide Ball so Susan could catch up with old friends and introduce them to Isaac. By Sunday morning we could only eat breakfast and check our seedlings which have started to sprout before passing out for a nap in the middle of playing. 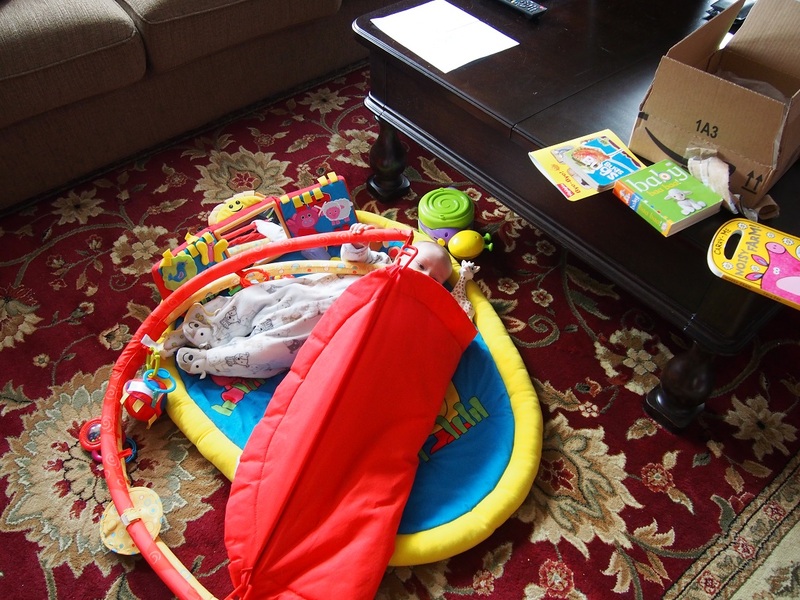 First Isaac pulled down his playmat and pulled it on top of him to snuggle with. The rest of the day hopefully should hold some yard work and hopefully a run although naps may win out as the preferred activity. Posted by brian: April 14th, 2013 under Family. I’m not sure whether the fact we still have isolated patches of snow is a testament to the amount of snow we received, the fact that we have a lot of shade in our yard, or both. In any case the danger of snow appears to have passed and it’s time to start gardening. Last year at this time I hadn’t even started clearing the space for the raised beds so we’re certainly in better shape than last year. This year we ordered our seeds from High Mowing Seeds. 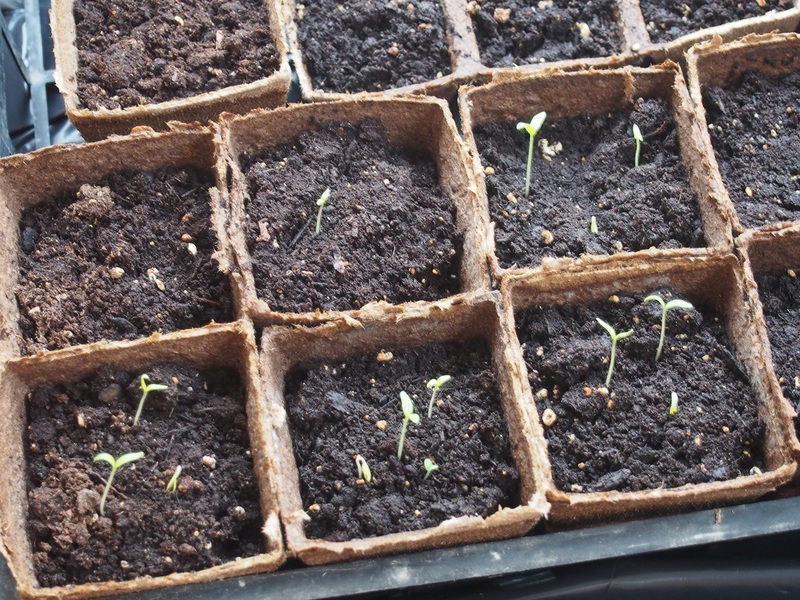 Because we got a head start on last year we decided to start some plants indoors and also direct seed some early season seeds in the hope of getting an early first harvest. Here’s a picture of what we started indoors on Saturday. Our sunroom has large windows which face south and west so that’s where we’ll be putting the seeds to germinate and grow. At some point very soon we have to figure out how to keep Slinky away from them. On Sunday we got into the yard and worked some bags of composted manure into two of the six beds. Then we planted radishes, lettuce, beets, peas, kale, spinach, chard, and cilantro. We’re planning on doing another planting of these same crops in about two weeks. Hopefully by staggering them we won’t be stuck eating beets and radishes for 1 straight week in June and we’ll be able to harvest gradually. Shh, don’t tell her parents, but Susan willingly planted peas. 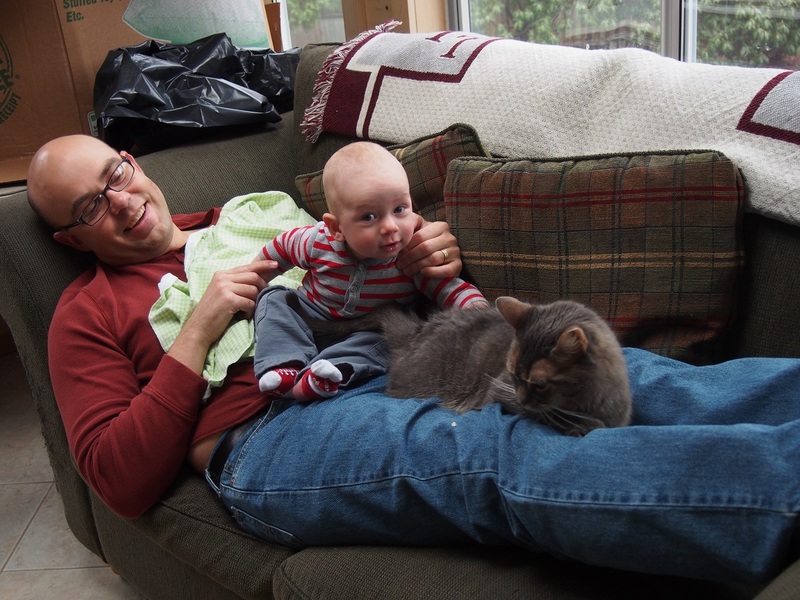 Posted by brian: April 8th, 2013 under Food, Home, Us. Thursday was our last full day and we decided to spend it at the Boone Hall Plantation that was conveniently located near the Isle of Palms. 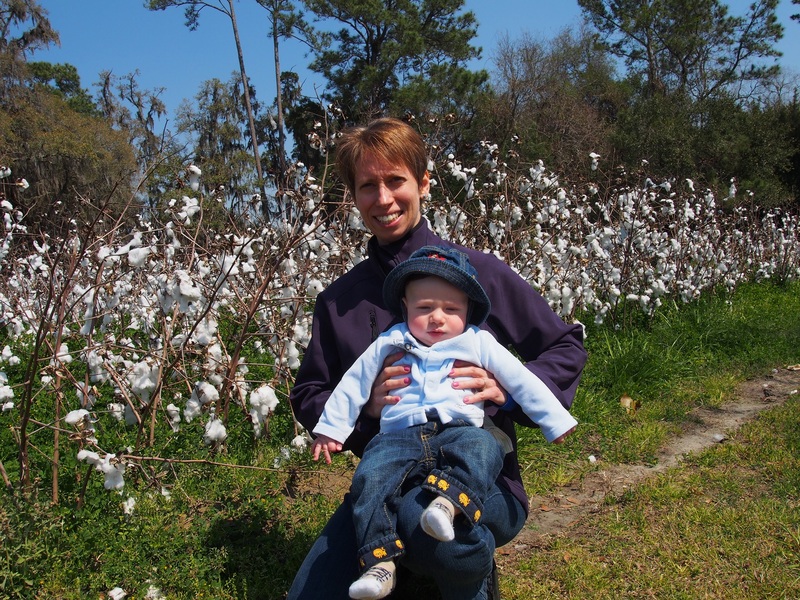 While there we took a guided tour of the grounds in an open air trolley, learned a bit about the Gullah, walked through nine slave cabins, and did about half of the plantation house tour before Isaac informed us it was time to go home. The plantation still grows produce which is sold locally. 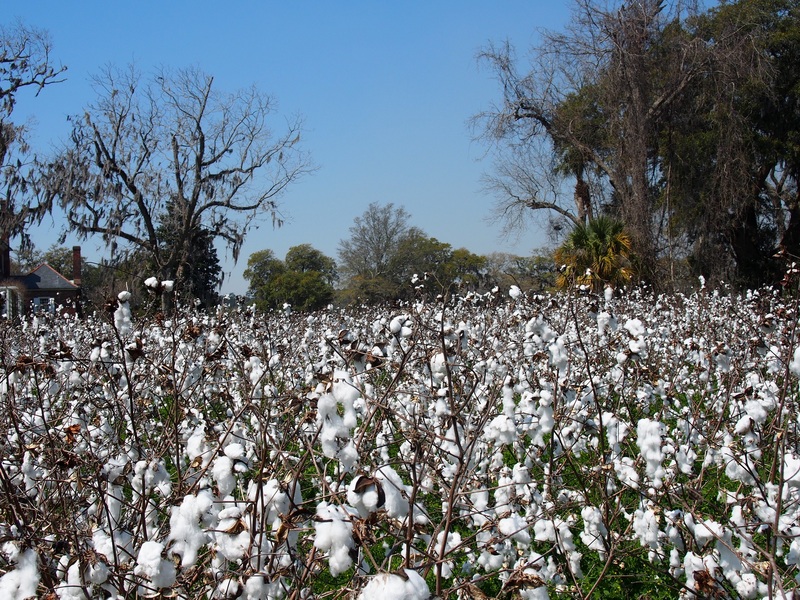 In its past, the plantation has belonged to several families who have grown cotton, pecans, and indigo among other crops. They still grow a small field of cotton for show which was very pretty. After we left the plantation we went to their market and bought some of their strawberries and peach cider. That afternoon all of us walked down to the beach to take some final photos with the Kennealys. The next morning Susan, Isaac, and I went back to the beach to try to get a few shots of Isaac. He mostly wanted to keep his head down and not look at the camera but we managed to take some cute shots anyhow. We cleaned up the house and left midday on Friday, drove as far as Richmond, VA, and continued the final 9 hours home on Saturday. Things learned this trip: vacationing with another family is fun, driving (if you make the time) is better than dealing with airlines, Charleston is a lovely city, and even a cold day in South Carolina is warmer than Boston in March. Our complete set of vacation photos is uploaded at flickr. Posted by brian: March 19th, 2013 under Us.